When you’ve reached a certain skill set, nothing is ever going to change if you don’t level up. You have to learn new things and you need to do it consistently to keep on growing and earning money. If you want to generate more money in your business, you don’t get to be satisfied with the status quo. They think they’ll always make the money. They think the money will just grow without them having to do anything to make that happen. That’s not how business works. On the flip side, you have folks who bounce around from this to that to the other thing with too much damn excitement. That shiny object syndrome can be hard to resist. Is this you? It’s ok if it, cuz I’m guilty of this too from time to time. Seriously, every day I find some new thing I wanna buy, or try, or take for a trial run. It’s times like these when I have to become my own therapist, smack my own hand and say NO NO NO! When you’ve reached a certain skill set, nothing is ever going to change if you don’t level up. In today’s world, you can straddle the spectrum of complacent and scattered. When you start a business, it can be easy to become overloaded with excitement. It happens often because there are countless options available. One of the things that entrepreneurs have to be on guard against is shiny new object syndrome. Instead of being satisfied using the tools at our disposal, we find a new technique, new software, new tools and we chase after them. The beginning of something is always exciting because it holds the promise of success. It’s what we’ve always been waiting for – this new idea or tool – so we have to do it or have it. The problem with so many options is that it can cause you take off down various paths and end up preventing you from actually accomplishing anything at all. It’s a lack of attention and focus that can derail your business if you’re not careful. 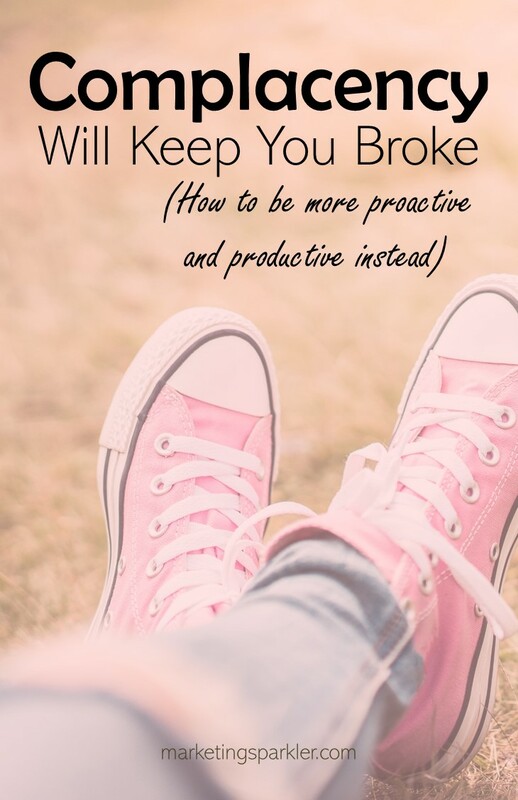 This lack of focus can keep you just as broke. This is just as bad as being complacent. It’s actually worse, because your attention is being diverted from your mission. And all these shiny objects will cost you too much time and money! When you’re chasing the newest idea, you’re not spending time on your business. You’re not focusing on the things that matter with it. When you experience shiny new object syndrome, it can make you a jack of all trades and a master of none. A more subtle result can do you more harm to your profitability: being a master of none will seep into your messaging. Being a master of none can dilute your brand, and if you’re not careful, you can very well end up B-R-O-K-E. People won’t understand your message, which leads to confusion over your offers. A confused mind doesn’t hit the B-U-Y button. You’re so busy chasing whatever new thing that comes along that you don’t complete the tasks that you should do to make your business a success. The result? You lose time and money on things that are wrong for your business. A more subtle yet harmful result of shiny object syndrome: being a master of none will seep into your messaging. You can get caught up in information overload, too – just like you can with shiny new object syndrome. You can stop all of these situations from happening. If you have found yourself in complacency mode, take a moment to figure out why. You may need to re-evaluate your goals for your business. If you have reached your goals, it’s time to set some new ones. If you have become complacent because you have mastered a certain skill set, it might be time to expand your knowledge base. The point is to challenge yourself! The challenge can be big or small, as long as it gets you out of your comfort zone! With shiny new object syndrome, when something new comes along, always ask yourself if you have something that needs to be finished. With shiny new object syndrome, when something new comes along, always ask yourself if you have work to be completed. If there’s something waiting for you to work on, don’t get involved in another project until the other one is completed. With information overload, only take in the information you need to complete your task. Focus on one piece of information at a time. Remember that it’s better to do one thing well than to do a dozen things poorly. 1. Complacency will keep you broke. 2. Shiny object syndrome costs time and money. 3. Entrepreneurs are always learning, applying new ideas and working toward growth. 4. Temper your enthusiasm: don’t get stuck, but don’t get so excited that you try everything at one time. 5. Enjoy the journey. I certainly do. Do you find yourself getting complacent from time to time? How do you get yourself unstuck?